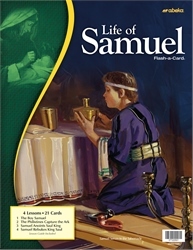 Encourage your child to listen to the calling of God with the Life of Samuel Flash-a-Cards. With 4 lessons and 21 picture cards, teach your child about Samuel’s journey from learning from Eli to becoming a spiritual leader of Israel. Included is a detailed lesson guide which gives you content to teach, prompts to use the pictures, and review questions for each lesson. Use these full-color illustrations to encourage your child to follow God’s Will.